Hey all! Happy Saturday! I've been a busy bee getting ready for my team meeting this afternoon. I love getting together with my team to spend time stamping. It's a great opportunity to learn from one another and it's a great bonding experience. And I would love to have you join us and the month of July is absolutely, hands down the BEST time to join right now. Why? Well because in addition to the usual awesome deal of getting $125 in product YOU CHOOSE, you now also get to choose an entire color family of ink pads! That's 10 FREE ink pads! And the only thing you need to decide there is, do you like Neutrals, Regals, Brights or Subtles? So, seriously, you should give this some serious consideration. And, did I mention, there is NO OBLIGATION beyond purchasing the starter kit....unless you decide to keep getting the awesome 20% discount that has the potential to become a 25% discount. 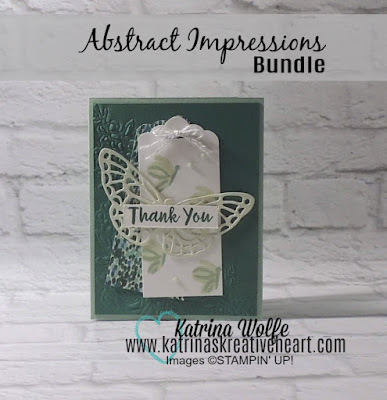 So while you let that sink in for a minute, let me share with you a gorgeous card I made with the Abstract Impressions. Now, to be completely transparent, I totally CASEd this card from a swap I received from a very talented demonstrator, Pam Steckman. I just changed up the colors and the sentiment. Links to all supplies used found below. Standard Card base of Mint Macaron: 8.5" x 5.5" scored and folded at 4.25"
Shaded Spruce: 4" x 5.25"
Garden Impressions DSP: 2" x 4.5"
Run the Shaded Spruce piece through the Big Shot with the Springtime Impressions corner image Thinlits die and the embossing mats (you only want to emboss the image, not cut it) and adhere it to the card front. Next, punch the tops of the Whisper White and the DSP with the Scalloped Tag Topper punch. Stamp the abstract butterfly (3-step stamping) 1st with Soft Sea Foam, 2nd with Mint Macaron and 3rd, the body also with Mint Macaron randomly over the Whisper White piece. Layer the DSP behind the Whisper White at an angle so that you see the DSP peeking out from behind. Adhere these tags to the card front. Next, run a scrap piece of Soft Sea Foam through the Big Shot with the butterfly die from the Springtime Impressions Thinlits collection and once you remove all the "bits" adhere this to the card front using a mini Stampin' Dimensional. Next, stamp the sentiment, Thank You from the same stamp set, onto a piece of Whisper White that is 0.5" wide and long enough to accommodate the sentiment and add that across the butterfly with a couple of Stampin' Dimensionals. Finally, make a double bow with the White and Silver Bakers Twine and add to the tags with a mini Glue Dot and sprinkle a few of the small Mint Macaron dots from the Faceted Dots collection.